Apologies for the radio silence guys... I started a really exciting new project doing some full-time freelance work for InStyle magazine's digital fashion team. It's been amazing so far, but I've totally let my other responsibilities slack—including le blog. But I'm back! I spent a long weekend in California celebrating my favorite bride-to-be, but now it's back to the city and back to the grind. I've been missing all that desert heat, and missing spending the whole day in fun, funky, and ultra-comfortable slide sandals. I brought a bunch of other sandals with me (I'm an over-packer, I can't help it!) 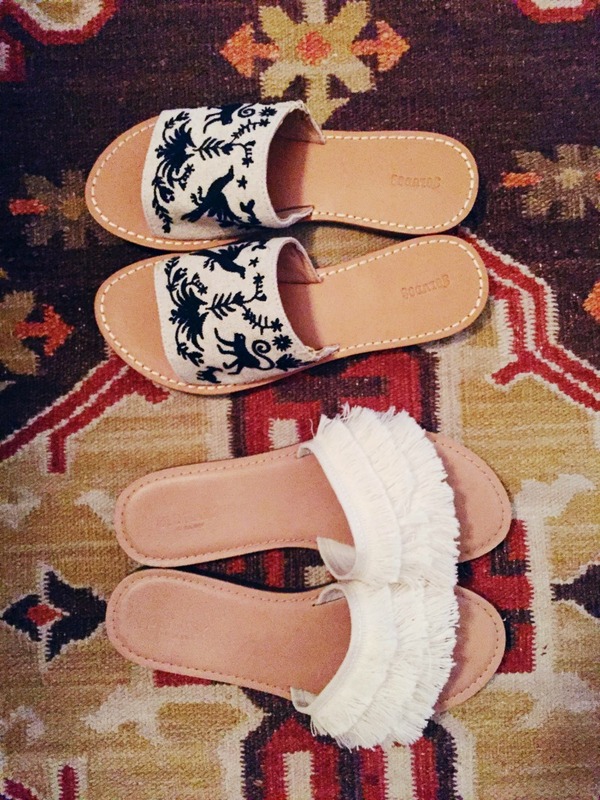 but ended up only wearing two pairs: these embroidered Soludos slides (currently on sale! ), and a fringe-y pair from Old Navy. I've always loved Soludos and their affordable, practical espadrilles, and now I'm totally addicted to these slides. However, I feel a little weird wearing them in the city. Is that strange? To me their ultra-flat sole and exposure puts me rather close to the sidewalk and all its "stuff"... Ugh, I'm not going to dwell on it for now. I’ve been browsing on-line greater than three hours today, but I never discovered any attention-grabbing article like yours. It is beautiful worth sufficient for me. Personally, if all webmasters and bloggers made good content material as you did, the net will be a lot more helpful than ever before. These slides are awesome! Believe me, you are very creative person! I think that these slides sre very stylish! Use dissertation, if you want to know more! Nice post.It is looking really good. I like the first one the most. They are so trendy and stylish. Nice shoes, I would get them if I could. This blog contains beautiful messages and contents. Interesting to read. Keep on sharing. It’s very perfect news. Good job thanks for sharing. I really enjoyed this article while reading. Thanks for a great share. First of all thanks to the author. I refferd more things in the given article. Thanks for sharing a worthable blog. Its interesting to read. Article is neat and interesting with best information. Details given in this website is wonderfull. Informative things are given, thanks for sharing.